Medline BioCon-500 Bladder Scanner, Medline BioCon-500, Medline Urology- More advanced algorithm, more powerful bladder wall recognition technology, more accurate Contour technology, higher accuracy of the probe makes scanning results more accurate. 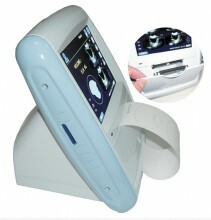 New algorithm, the measurement results are not subject to the bladder shape and size. No need to select Gender, Age group and no need to consider special cases such as the effect of hysterectomy on the measurement results. Good compatibility for different bladders, no substantial error when measuring small volume or special shape bladders, easier to operate and use. High recognition rate for the bladder wall with air, accurate amount of urine volume even when the bladder is not fully filled. With manual Contour functions, when automatic Contour is really difficult, this can be manually contoured through touch screen, to ensure that accurate results can be obtained even when the bladder border is abnormal. Real-time imaging during the scanning process, real-time monitoring of catheter insertion to better prevent pain caused by inappropriate insertion. The probe uses new three-dimensional stepping motor, can maintain lasting high-precision scanning, periodic calibration is not needed. Built-in identifiable parameters within the probe, the probe can be quickly replaced without the need for secondary calibration. Built-in 24wh large capacity battery, continuous working time> 4 hours, and the battery can be quickly replaced. Touch screen operation, simple menus, easy and quick to use. Dimension: 200mm (height) × 160mm (width) × 140mm (thickness).